A winning combination at Camping Cala Ginepro: Holidays, Sports and Sardinia! Sporting holidays in Sardinia and life in the open air…at Camping Cala Ginepro, you’re in the right place! Playing sports on holiday is the ideal way to keep fit, through some healthy physical activity, while having fun at the same time. 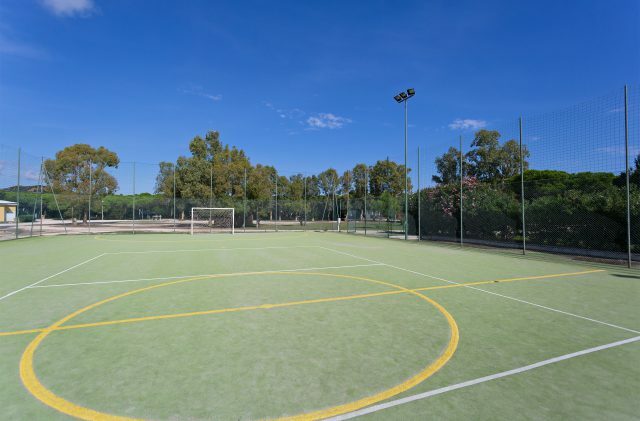 Alongside all of the equipment available for hire on Cala Ginepro beach and at Reception, if you really want to get the most out of a sport-filled holiday, at Camping Cala Ginepro you can make use of the wonderful, multi-purpose pitch, which is perfect for 5-a-side football matches, bowls and volleyball. You can challenge your friends (and adversaries!) to exciting matches, getting stuck in to all the sports you love! The synthetic-grass pitch can even be used in the evenings, since it is benefits from floodlighting. You can book the pitch at Camping Cala Ginepro through Reception. The hourly rate can be split between all of the players, regardless of how many people are involved. During summer, the sports field can actually be used free of charge by taking part in the matches and tournaments organised by the entertainment staff. In this way, you can have great, free fun along with other guests, making new friends as you play football or volleyball on the specially designed pitch! Playing sport on holiday is a great way to stay healthy, keep fit and meet other people with the same passion. Contact us for any information you may require: your sporting holiday in Sardinia awaits you at Camping Cala Ginepro!